This strawberry almond milk with rose water is super easy, absolutely delicious, and loaded with nutrients. This recipe is raw, vegan, and paleo friendly. 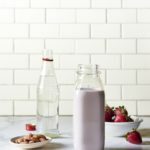 This strawberry almond milk with rose water is super easy, absolutely delicious, and loaded with nutrients. This recipe is raw, vegan, gluten-free, dairy-free, and paleo friendly. It is also low in natural sugar, alkaline forming, and anti-inflammatory. If you are watching your sugar intake, substitute 5 drops of alcohol-free liquid stevia for the dates. I cannot stop making this strawberry rose almond milk. Those of you who follow me on instagram you would have seen me blending up this divine almond milk every day for the last few months. I just cannot stop drinking it. It is so delicious! I make different fresh homemade nut and seed milks every week for nutrient diversity and taste-bud satisfaction, I blend up a different kind of milk every couple of days. I’ve posted many basic plant-based milk recipes on the site over the years. This year, I’m going to post some of my favorite flavors to give you further inspiration to keep things interesting. But, I had to start with this strawberry rose almond milk recipe. It is on heavy rotation in our house, and it doesn’t look like I’m going to get sick of it any time soon. And, I’m not the only one who is obsessed. The instagram story (highlighted at the top of my profile) was one of the most viewed stories I’ve ever posted. After I posted the story showing everybody how to make it, I was overwhelmed with literally hundreds of instagram messages and emails of love from people who had made it. And, it is so easy! Start by making a basic unsweetened almond milk. Then strain the milk (use the almond pulp to make body scrub), wash your blender container, and pour the strained milk back into the blender. Then, blend in your fresh strawberries, dates, and rosewater. The milk will keep in the fridge for 2 to 3 days. But, it never lasts that long. Mine is gone in less than an hour! The combination of strawberry and rose is exquisite. I shared a probiotic-rich rose-berry coconut water kefir drink in The Perfect Blend. I made mini rose-berry cheesecakes for Mother’s Day for my mum, and I’m not done with this magic match any time soon. But, this strawberry rose almond milk is the quickest, easiest way to blend your way to rose-berry bliss. For those of you who haven’t used rosewater, it is the liquid that is left when roses and water are distilled to make rose oil. For culinary purposes, rosewater has been used in Middle Eastern and Asian cuisines for many years. Rose water can be found at health food stores, Middle Eastern grocers, and exotic foods shops. Use 100% pure rose water. Some are blends of 80% rose water, 20% water and natural flavoring. Do not buy rose syrup, which is loaded with refined sugar, citric acid, and artificial colors and flavors. I use the Cortas brand, which I pick up from a little grocer around the corner from my house. It is $2.99. So, it’s not expensive. I was so inspired by the strawberry rose almond milk love on instagram that I had to share the love with all of my family and friends. I hosted a celebratory graduation brunch for my dear friend’s daughter last week, and we set up a smoothie and milk buffet where guests could make their own smoothies and flavored nut milks. 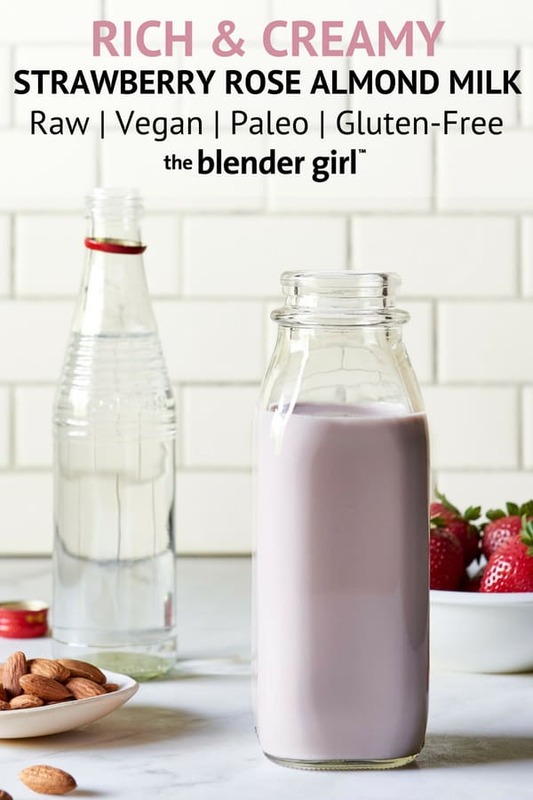 We made this strawberry rose almond milk, as well as blueberry lavender almond milk, turmeric cardamom almond milk, chocolate chile almond milk, and the alkaline green almond milk. (Yes, I will post all of those recipes in the coming months!) It was epic! So much fun, and so so delicious. We had a white and green color theme, with white tables and flowers and beautiful green leaves and herbs running all down the table. It was absolutely stunning. So, my white KitchenAid® Pro Line® Series blender and matching stand mixer and toaster looked so beautiful on the buffet table. I set up the citrus juicer attachment on my stand mixer for people to make freshly squeezed orange juice, and my little two-slice toaster was perfect for people to make fresh toast bagels, and muffins as they needed them. It was amazing. I like all of my appliances to match, and I love that my blender now matches my stand mixer, food processor, chopper, coffee maker, grinder, knife block, and toaster. I’ve got all of the Pearl White stuff and I love it. Check out the entire Pro Line® Series range. It is stunning. But, back to the strawberry rose water almond milk. Do not miss making it. It is just absolutely divine. Leave a comment below and share the love! *I am a paid spokesperson for KitchenAid® blenders. But, all opinions contained herein are my own. To soak the almonds, place the nuts in a glass or ceramic bowl or large glass jar, and cover with filtered water. Add 1 teaspoon Celtic sea salt and splash of fresh lemon juice or apple cider vinegar. Cover the container with a breathable kitchen towel, and allow to soak at room temperature for 12 hours. 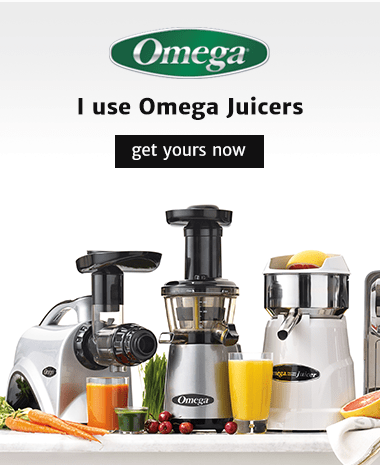 Throw the rinsed almonds and clean filtered water into your blender, and blast on high for 30 to 60 seconds, until the nuts are completely pulverized. Rinse your blender container, pour the strained milk back in, and add the strawberries, dates, rosewater, and salt. Blast on high for 30 to 60 seconds until smooth and creamy. Store the milk in a sealed container in the fridge. Activated almond milk (made with soaked almonds) will keep for 2 to 3 days in a very cold fridge. NOTE: To make this recipe alkaline, anti-inflammatory, and Body Ecology friendly: Substitute the dates for 1 1/2 tablespoons powdered birch xylitol and 1/4 teaspoon alcohol-free liquid stevia. To make powdered birch xylitol from granular, pulse in a spice grinder or coffee grinder.